Aside from the gelato inside the cases, the refrigerated gelato display cases also provide an authentic Italian experience. Created in a modern, jewelry-style aesthetic, Fatamorgana’s La Rossa refrigerated display cases are elegant yet complimentary to some of the rustic décor inside the store. And because of the La Rossa’s smaller footprint, Fatamorgana retains valuable square footage. See what Fatamorgana Gelato’s operators think about La Rossa, and get insights on what it takes to operate an Italian gelato shop in Los Angeles. Watch this two-minute video from Fatamorgana Gelato. 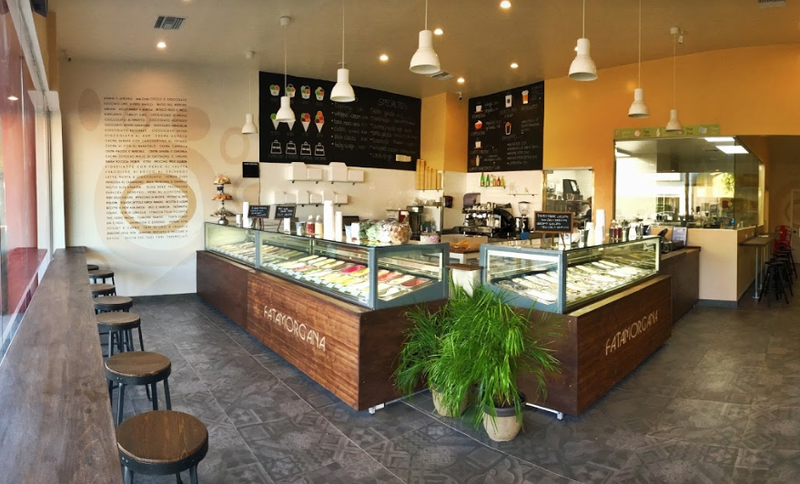 As you can see, Fatamorgana Gelato is a world-class operation that uses world-class gelato cases because they’re the only foodservice display cases on the market that can do justice to their product. Gelato that is made from scratch with the finest ingredients requires a display case like ORION by Clabo’s La Rossa. Adding a modern, jewelry-style design allows Fatamorgana to increase impulse purchases from elegance and enhanced visibility. Their dual pane, heated windows never fog up, and a nearly frameless design even provides sight lines for dessert-loving kids. Looking for the right gelato display case for your gelato or ice cream shop? Start with the ORION by Clabo Designer Guide and discover a world full of Italian-style options.